Hunched forward at the computer, collapsed in front of the TV, bent forward with an I-pad and smart phone while answering emails, updating Facebook, playing games, reading or texting—these are all habits that may affect our energy level. Students may also experience a decrease in energy level and concentration when they slouch in their seats. The low tech solution is not caffeine or medications; it is episodic movement and upright posture. In the controlledresearch study published October 5, 2012 in the journal Biofeedback, Erik Peper, PhD of San Francisco State University and I-Mei Lin, PhD of Kaohsiung Medical University, Taiwan, showed that subjective energy level can quickly be increased. In this study 110 participants rated their immediate subjective energy level and their general depression level. The participants either walked in a slouched position or engaged in opposite arm and leg skipping (see Figure 1). Figure 1. Illustration of slouched walking (left) and opposite arm and leg skipping (right). Reproduced from Peper & Lin (2012). Skipping even for even one minute significantly increased energy level and alertness for all subjects. 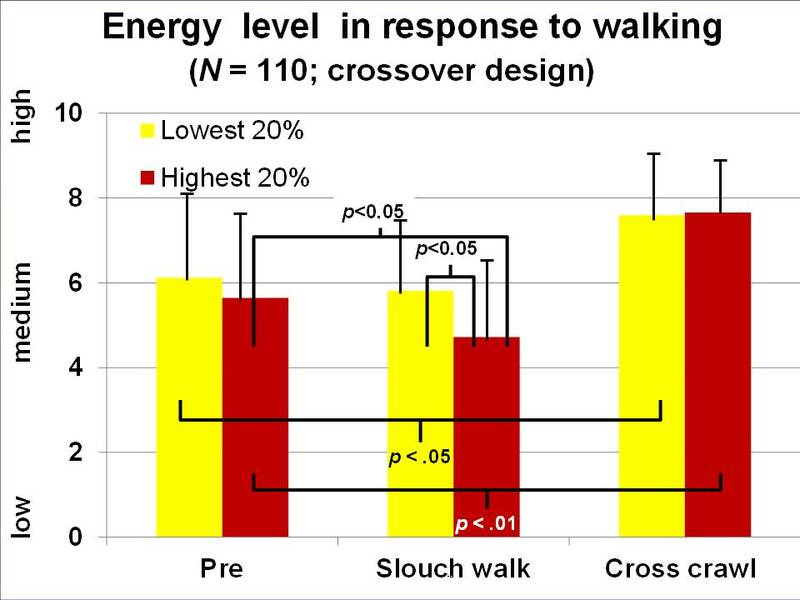 On the other hand, walking in a slouched pattern reduced the energy level significantly for those participants who had high levels of depression as shown in Figure 2. Figure 2. Self-rating of energy level for the top and bottom 20% of the students’ self-rating of depression. Reproduced from: Peper & Lin, (2012). For people with a history of depression, their energy level may covertly increase or decrease depending upon posture and movements. When individuals have less energy, they feel that they can do less, and this feeling tends to increase depressive thinking. They also tend to label the lower energy state as the beginning of depression instead being tired. At the same time, the lower energy state tends to evoke depressive memories and thoughts which escalate the experience of depression. This process can be interrupted and reversed by shifting body posture and performing movement. This study offers a strategy for people with depression to reverse conditioned cues associated with posture that evoke depressive thoughts and feelings. Wilson and Peper (2004) showed previously that ‘‘sitting collapsed’’ allowed easier access to hopeless, helpless, powerless, and negative memories than sitting upright and looking up. Posture appears to be aan overlooked aspect in the prevention of depression. There is hope if you tend to become depressed and experience low energy. Numerous participants reported that after they performed opposite arm/leg skipping they did not want to walk in a slouched position. This suggests that this type of movement my act as a protective mechanism to avoid energy decrease and depression. Some participants with attention deficit disorders reported that after skipping they could focus their attention much better. I recommend being more aware of your body posture during the day and increasing your arm and leg skipping movements. *Adapted from: Peper, E. & Lin, I-M. (2012). 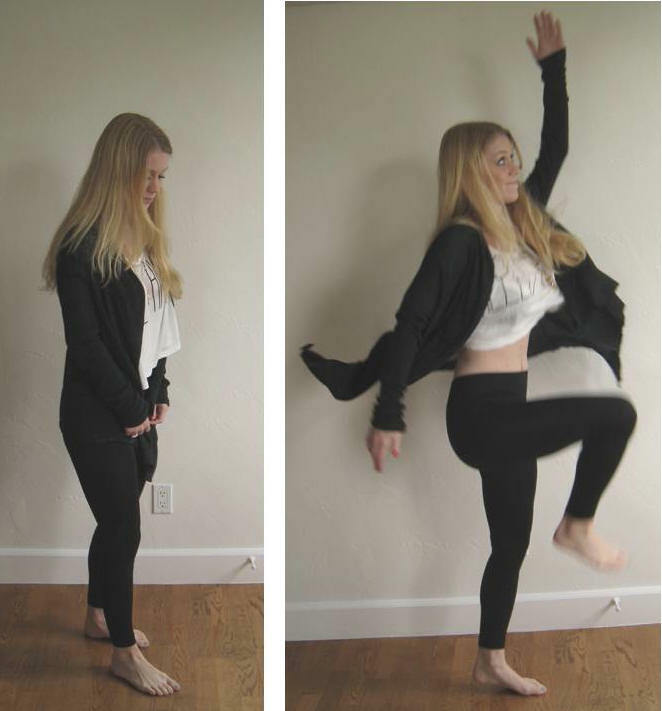 Increase or decrease depression-How body postures influence your energy level. Biofeedback, 40 (3), 126-130.